This increases the risk of their earning and cost of life (Seeds, health, daughter marriage, etc.). This creates a vicious cycle and most of the time farmers suffer of mental distress. Often they see the suicide as the only solution for their families. Last year to save farmers from debt and with intention to make their farming sustainable we started SHIVPRABHA FARMERS CLUB. 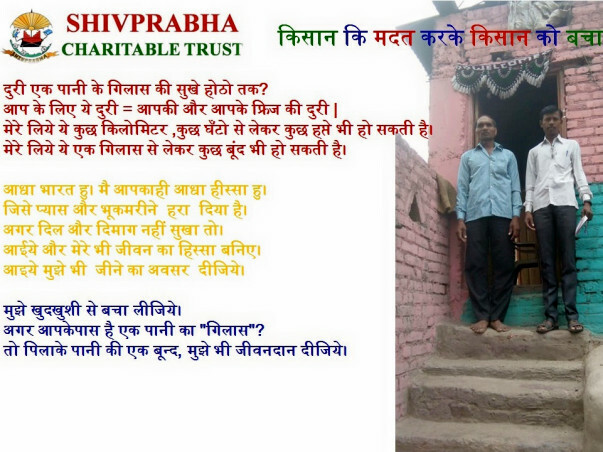 We not only supported financially but also technically and the results came excellent from all 30 farmers. Beauty is none of them took bank loan for said year whatever they have on their 7/12 is old one and they are hopeful to repay it soon. They not only took one crop of cotton, soyabin, Toor and etc but few of them took second crop of vegetables. Raju Bhise has took cotton and toor in 4 acre as first crop and vegetables in only 10 gunta with irrigation as second crop & earned Rs. 50,000/- per month by directly selling vegetables in market. Fakira Bolke got 12 quintal Cotton, 10 quintal Jwari and 1 quintal Toor from only 2 acre of land. Such examples are getting set by said farmers of Yavatmal district which was having maximum number of farmers suicides. We will keep sharing studies on regular interval. This year we like to add 20 more farmers in farmers club. We will start sharing their details. Beauty is that these existing 30 farmers going to support 12 new farmers which is main mantra of our farmers club “शेतकऱ्यांनो शेतकरी जगवा”, we need to support 8 farmers on financial and technical ground and we need Rs. 105K. Let’s stand with our Annadatta, our Baliraja to make them self sustained farmer to feed us as well as our kids.